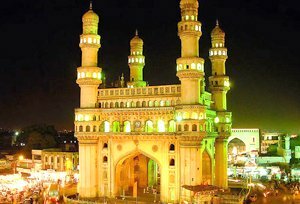 Mecca Masjid: It is the largest mosque situated close to Charminar. 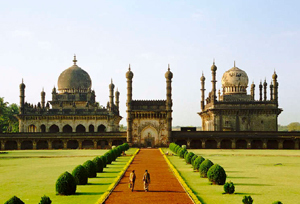 It was begun by Qutb Shah in 1614 A.D., but was completed only in 1687 A.D. by the Mughal Emperor - Aurangzeb. Naubat Prabhat: Popularly called Birla Mandir this temple built of pure white marble atop a hill and dedicated to Lord Balaji is a very popular tourist attraction. One can get an excellent view of the twin cities and the lake joining them. Morning after breakfast drive to Gulbarga. It exhibits a delightful synthesis of Hindu and Muslim cultures, as it was occupied successively by both Hindu and Muslim rulers. 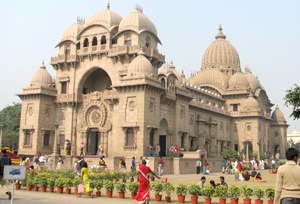 For the very reason the place upholds fine examples of Islamic as well as Hindu architecture. As a result, the town is visited with equal fervor by both tourists and historians alike. Gulbarga even has remains of a Buddhist culture. Upon arrival check into the hotel. In the afternoon visit The Gulbarga fort, a remnant of the Brahmani age has stood the test of time and the remnants of its architecture still make it worth your visit. It was originally built by Raja Gulchand. Later 15 towers were added by Allah-ud-din Bahmani. Also visit the Jama Masjid, built by a Spanish architect in the model of the Cordoba mosque of Spain. 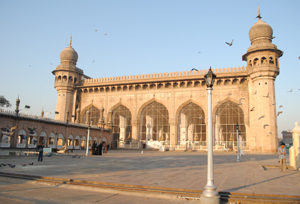 The Masjid is built in a peculiar style - the roof is composed of no less than 68 domes. The total area covered by the tomb is simply enormous and you can find mosques, temples, other buildings, towers etc. inside. There are a number of guns stationed in the fort, one of which measures to 25 meters in length. Overnight stay at hotel. After fresh-n-up city sightseeing tour of Bijapur, visiting Gol Gumbaz, The structure is composed of a cube, 47.5 metres (156 ft) on each side, capped by a dome 44 m in external diameter. "Eight intersecting arches created by two rotated squares that create interlocking pendentives" support the dome. At each of the four corners of the cube, is a dome-capped octagonal tower seven stories high with a staircase inside. The upper floor of each opens on to a round gallery which surrounds the dome. Inside the mausoleum hall, is a square podium with steps on each side. In the middle of the podium, a cenotaph slab on the ground marks the actual grave below, "the only instance of this practice" in the architecture of the Adil Shahi Dynasty. In the middle of the north side, "a large semi-octagonal bay" protrudes out. With an area of 1,700 sq m (18,000 sq ft) the mausoleum has one of the biggest single chamber spaces in the world. We will also visit Ibrahim Rauza and Jumma Masjid, Malik-e-Maidan. Overnight stay at hotel. Morning visit Mahakoota temples and Badami rock cut caves. Later after breakfast drive to Hospet. Upon arrival check into the hotel. Overnight stay at hotel. Morning after breakfast an excursion to Hampi. Later return to the Hospet. After a quick breakfast leave for Hassan. Upon arrival check into the hotel. Overnight stay at hotel. Morning after breakfast an excursion of Belur & Halebid. Later return to Hassan for overnight stay. Further continue drive to Mysore. Upon arrival transfer to the hotel. Overnight stay at hotel. 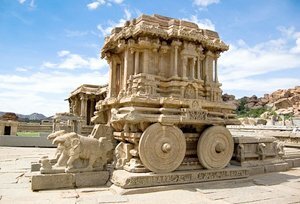 In the afternoon an excursion to Srirangapatnam, Ranganathaswamy Temple, Tippu's Palace, Fort, Gumbaz and Tippu's Summer Palace. 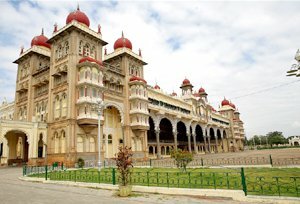 Later return to Mysore for night stay.